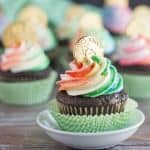 Make these pot of gold cupcakes for your whole crew this St. Patrick’s Day! They’ll love the rich, dark chocolate cake with the rainbow striped frosting, and the gold coin on top is such a fun touch! And I could not be happier about it because it’s MARCH! All throughout the dreary, blustery, bitterly cold months, I just keep my eyes on the prize that is March. March may come in like a lion, but it goes out like a lamb. Even though on Sunday, the first of March, we were being pelted with freezing rain and the slush was 3 inches deep, all I could think about was that in a few short weeks it will be Spring! Hooray! Another reason I love March is because St. Patrick’s day falls during this month. I have a lot of Irish in me, and in my younger days I used to love to spend the whole holiday in the pub, listening to the traditional folk music and sipping on pints of Guinness. Now that I am a mom I can’t really get away with doing stuff like that any more, but I do still love to celebrate the holiday with as many fun, Irish-inspired recipes as I can. Look out for a few really great ideas that utilize authentic Irish ingredients over the next few weeks. But for today’s post, I’m going with something that’s probably more fun than it is authentic. This is just a cute idea that the little ones are sure to love. If they’re anything like my kids, that is! My kids go ga-ga for anything rainbow. Or chocolate! The cupcake base is a deep, dark, chocolate that is so moist and soft, yet sturdy enough to stand up to a generous swirl of frosting. I love this recipe because it all happens in one bowl, easy-peasy, and you don’t even have to mess around with melting chocolate. I used a combination of this “black” cocoa and just regular, unsweetened cocoa powder. It gives a nice, deep color while still providing a bold, chocolate flavor that comes through like whoa. Also I love how it kinda looks like a black cauldron, in a way. You can use any kind of frosting you like, but I’m pretty partial to this Swiss buttercream. It’s so silky and light. But the real star of the show is the rainbow swirl. I thought you guys might be interested to know how to pipe striped frosting! It’s actually really simple, you just use a thin, clean artist brush to swipe stripes of gel paste food coloring down the inside of your pastry bag. Then fill it with buttercream and squeeze it out, just like you normally would. Top them off with a gold (chocolate) coin and you’ve found your pot of gold at the end of the rainbow. Hope you enjoy! 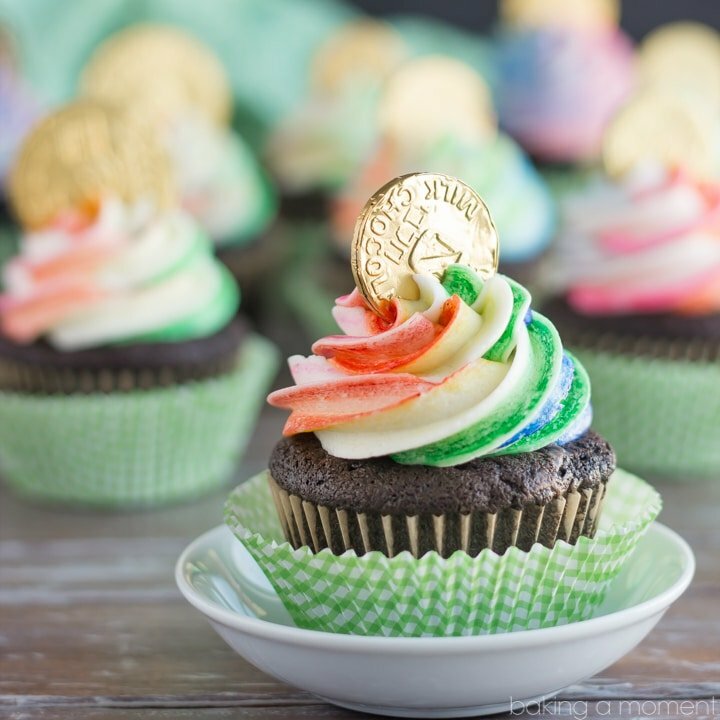 Make these Pot of Gold Cupcakes for your whole crew this St. Patrick's Day! 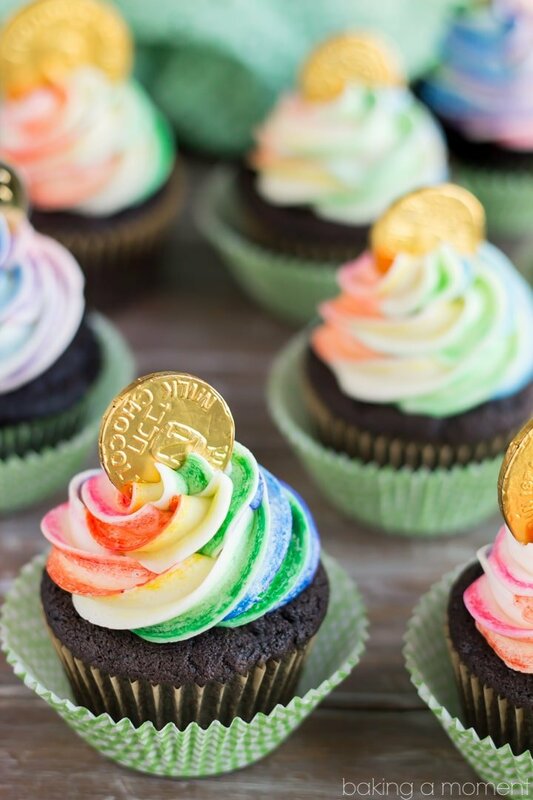 They'll love the Rich, Dark Chocolate Cake with the Rainbow Striped Frosting, and the Gold Coin on top is such a fun touch! 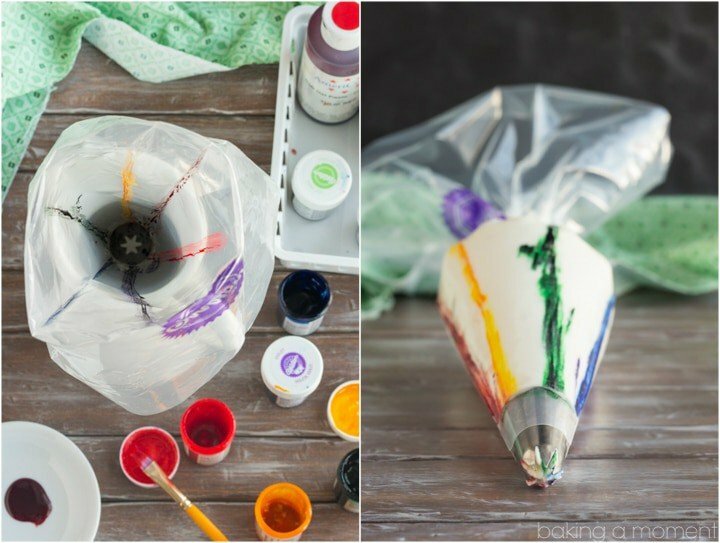 Using a thin (clean) artist brush, paint stripes of food coloring along the inside of a large pastry bag fitted with a 1M tip. Fill the bag with Swiss buttercream and pipe the frosting on the cooled cupcakes. 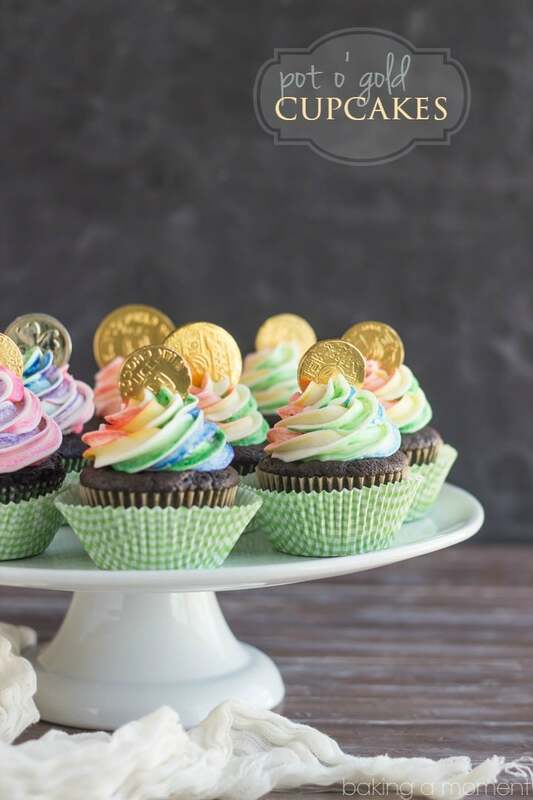 Garnish each cupcake with a gold coin. The rainbow frosting idea is brilliant, Allie!! Also, the gold chocolate coin is the perfect finishing touch for these! LOVE THEM!! Aw, thank you so much Tiffany! Hope you’re having a great week sweetie! Allie, I LOVE how you created the rainbow swirl!!! Wow, that’s such a cool technique!!! I love these cupcakes! Isn’t that such a great technique? I learned that years ago when I was working at a bakery. So simple yet such a cool effect. So glad you enjoyed; thanks Alice! Hahaha no pub for me any more! We’ll just stay home and eat rainbow cupcakes this year 😛 Thank you so much for your sweet compliments Kathleen! Hope you are having a fabulous trip my dear! I love chocolate cupcakes, but the rainbow swirl is the real winner here! So creative and cute looking! Wow, these are the prettiest Rainbow cupcakes I’ve ever seen! Thank you so much for sharing the tip on how to get the rainbow stripe. I can hardly believe it is that easy…. maybe even someone like me could pull this off. And the gold coin is the perfect touch! Girl you could totally! You are so crazy talented, these cupcakes would be a snap for you! Thanks so much Meggan! What fun cupcakes! Love the rainbow swirl! I don’t have a stitch of Irish in me, but I love St. Patrick’s Day! These cupcakes are the most beautiful things, and you just made that rainbow frosting look so easy with those photos. I’m loving these! Pinned. Allie, this is so fun! Chocolate + rainbow – I’m definitely on your kid’s side. Glad that March is here, too. It’s horrible out right now- but odds are this is one of the last freezing rain storms we are going to have for a while! Thanks my dear! You got me instantly with the name! I love this Allie!! And CHECK OUT those colours in the frosting! 🙂 I never would have figured out that’s the way you get those streaks!! Thank you so much Nagi! Yep, I learned that frosting trick years ago- pretty simple right? These are amazing! The rainbow frosting is adorable!!! Oh Tammy I have no doubt you could totally knock these out of the park! It’s way easier than you’d think and you are so talented! I am so glad it’s finally March too! 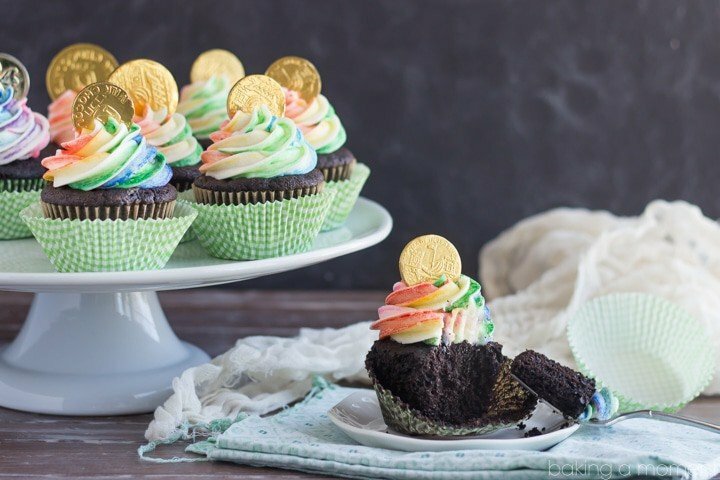 These cupcakes are perfect for St. Patty’s Day 🙂 The rainbow swirled frosting looks perfect and that gold coin is such a fun touch! Oh Allie, you are just so damn talented I can’t even stand it sometimes! I just adore your work (and YOU) so much. These are the cutest cupcakes eva! These are so cute, and they look pretty darn delicious. Nothing beats Swiss meringue buttercream 🙂 I know – March brings some hope to the end of the cold, plus day light savings kicks in, so finally it doesn’t get dark so early. Believe it or not, there’s no Irish in me (lol! ), but I love St. Patty’s Day for the rainbows. I LOVE making rainbow desserts, and my kids love eating them, so it’s a win-win. Yes! Rainbows are so much fun for St. Patty’s and totally necessary when the weather is at its dreariest. I couldn’t agree more! Thank you so much Aida and I hope you’re keeping warm sweetie! You demonstrated how to do the rainbow swirl in the pastry bag so nicely. It looks so pretty and I love the name of the cupcakes. Perfect for Saint Patricks Day. I am the same as you when it comes to March. It’s just a matter of time before Spring! Woo hoo! I’m ready girl. So glad you thought I demonstrated it well. I was worried my photos wouldn’t make it clear enough. Thank you so much sweetie! So do I Culinary Mama! And so do my kids, lol. Thanks so much! How fun! St Patrick’s day is an underappreciated holiday! Gah I do deserve it! It’s been too long man… thank you! Allie, I love this! It’s super creative and they look so very tasty. They look amazing, Allie!!! BTW I’ve found my new favourite vanilla cupcake (we had both chosen the same recipe some time ago, do you remember?). So I thought you might wanna give it a go. It’s Billy’s Vanilla Vanilla Cupcakes and I found it at 52cupcakes.blogspot.com (instead of extract I used vanilla paste as I usually do). I haven’t posted it yet but I made it last week and it’s totally worth it! Ah! I remember that recipe! 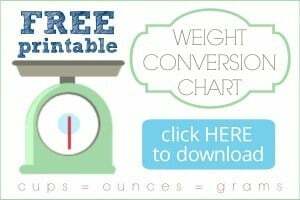 I have actually tried it myself and it’s great! That’s so cool how you did the frosting! I love these! Tell me about it. I can’t wait until all this snow melts (it’s snowing right now :-() and I get to enjoy my deck once again. Love these cupcakes. They are super cute and I can’t wait to try out the striped piping technique. How fun is that? Right?? I always thought that was such a great trick. It’s snowing where I am too Lynn! We got about a foot dumped on us today. Eep! Thanks so much for the sweet comment Lynn and I hope you’re keeping warm! These are gorgeous my friend! How do you make everything so dang amazing! My kids would inhale these cute little things. I hear you on the weather. March is usually what I long for too. But I’m wondering if that won’t happen til April this year. As snow is growing increasingly outside right now! Oh well, it’s bound to get here sooner or later. Have a great one friend! This snow is nuts, right??? We got like a foot how about you? So much for Spring haha! Thanks Melanie! These are absolutely adorable! So fun and festive. Pinned. It’s pretty simple, right Jen? I love that trick- so clever. I’m so happy you enjoyed; thanks for the sweet comment dear! They are- super chocolatey! I love that recipe it’s the best I have found. Thanks so much Kayle! Hope your week is off to a super start sweetie! They’re perfect!!! My son’s class is having a party so I signed up to bring chicken nuggets…Im going to scratch that out and sign up for cupcakes…these! Allie – I’m 24 and I still love rainbow and tie dye! I guess I never grew up. Haha. These are an adorable and absolutely creative dessert to celebrate St. Patty’s Day. Aw- thanks so much Erin! I have to admit I still love rainbow too! I guess we are just young at heart 😉 Thanks sweetie! Pingback: Lucky You | When it has to work. I would love to use one of your photos and a link back to this page on my rainbow cupcake round up! Would that be ok? Hi, can we use any type of frosting, or is the Swiss merengue the best for piping with the rainbow effect? What size of chocolate coin did you use? Where did you buy your chocolate coins? The link to your chocolate coin doesn’t seem to work. They’re just standard size Jazzmin, you can kind of gauge by looking at the pics and comparing with the size of the cupcake. Maybe an inch or so in diameter? I just typed chocolate coins into Amazon’s search window; here’s what I came up with: http://www.amazon.com/s/ref=nb_sb_noss?url=search-alias%3Daps&field-keywords=chocolate+coins. I tried these tonight. They turned out ok but not as beautiful as yours! Not sure what I did? Maybe need some more practice. The 1st couple had way too much food coloring! I would post a pic of mine but don’t think it will let me. I’m sorry they didn’t come out well, Ashley! Practice definitely makes perfect and you want to be careful to just use a small amount of gel color. It’s very concentrated! So much for for St. Patrick’s Day!